Siemens Healthineers is set to introduce new Symbia Intevo Bold, which integrates single-photon emission computed tomography (SPECT) technologies with advanced CT capabilities for use in a range of clinical applications. 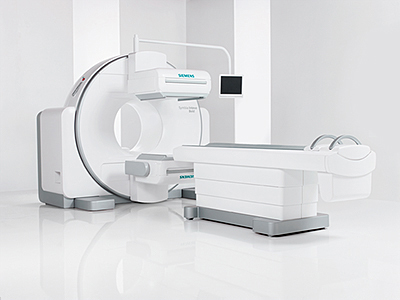 Symbia Intevo Bold has been designed for health care facilities, which will use SPECT/CT systems in a dual-use setting. The system features sinogram affirmed iterative reconstruction (SAFIRE) algorithm, which enables to produce enhanced CT image quality while reducing patient radiation dose by up to 60%. Symbia Intevo Bold also features iterative metal artifact reduction (iMAR) algorithm that will decrease metal-related artifacts caused by metallic materials to products such as orthopedic and dental implants. Its interleaved volume reconstruction (IVR) feature can restore overlapping CT images up to 32 slices to extract the maximum amount of diagnostic information from measured data, helping to assess small structures such as lesions or fractures. In addition, the single-source dual energy capability of Symbia Intevo Bold is said to deploy two sequential spiral CT scans operating at different kV levels to combine tissue information with disease morphology, enabling to improve image quality. According to the company, Symbia Intevo Bold is not commercially available in all countries over regulatory reasons. Siemens Healthineers molecular imaging head Jim Williams said: "Symbia Intevo Bold advances the dual-use capabilities of SPECT/CT, enabling exceptional image quality in both forms of imaging at the lowest possible patient dose. Earlier this year, Siemens Healthineers collaborated with Biogen to develop new magnetic resonance imaging (MRI) tool for multiple sclerosis (MS). The partnership intends to develop MRI applications to quantify crucial markers of MS disease activity and progression. Image: Siemens Healthineers’ Symbia Intevo Bold SPECT/CT system allows customers to expand dual-use capabilities in computed tomography. Photo: courtesy of Siemens AG.